To realize the full potential of human simulations in interactive environments, we need controllers that have the ability to respond appropriately to unexpected events. 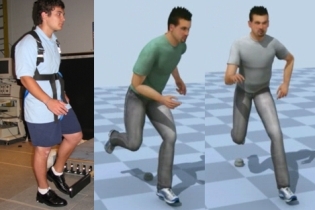 In this paper, we create controllers for the trip recovery responses that occur during walking. Two strategies have been identified in human responses to tripping: impact from an obstacle during early swing leads to an elevating strategy, in which the swing leg is lifted over the obstacle and impact during late swing leads to a lowering strategy, in which a swing leg is positioned immediately in front of the obstacle and then the other leg is swung forward and positioned in front of the body to allow recovery from the fall. We design controllers for both strategies based on the available biomechanical literature and data captured from human subjects in the laboratory. We evaluate our controllers by comparing simulated results and actual responses obtained from a motion capture system. 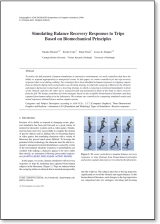 "Simulating Balance Recovery Responses to Trips Based on Biomechanical Principles"